My trainblog is NOT abandoned. It's just that the requirements for the predominant bulk of my posts mandate HD video uploads and larger photo files. I can't tell you how many videos I've recorded in the past two months -- in concert with a number of digital still photographs. But, for the bulk of time, I find myself posting at my cabin in the Sierra Nevada mountains, and my dial-up connection there is not what one would consider conducive to timely uploads to either YouTube for my videos or to Blogger for photographs over a handful of megs. There are some great videos coming. More train meets. The inside of a cab. Snow and rain videos. Some interesting track movements (like reverse-running). A video that, when you see it, you'll cringe. And a video that almost cost me some serious trouble. And finally, while I thought that by this time I'd be retired (after 35+ years) and able to post more frequently and, further, get into video editing -- no such luck. The economy up and slammed me -- as it likely slammed you as well. Therefore, work still takes up a bulk of my time. In the meantime, please enjoy the two Amtrak photographs. The above photograph, taken in the summer of 2010, shows Amtrak #6 running eastbound through the concrete sheds still in existence at Soda Springs. Lead Genesis engine #202 is a GE Dash9-P42-B, built in 2001, sporting 4,200 hp and the standard four-cycle engine with B-B trucks. The photograph below shows, again, Amtrak #6 running uphill on the #2 track just past Secret Town. Lead locomotive is GE Genesis #148, an identical engine to that listed above; Amtrak has 87 of those locomotives numbered in the 121 to 207 range. 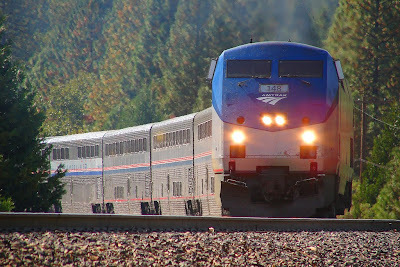 For those new to the blog, Amtrak runs two trains daily over Donner Pass on the main #1 (west) and #2 (east) tracks. The westbound train is Amtrak #5, and the eastbound train is Amtrak #6. This passenger train is called the "California Zephyr" and runs between Emeryville, California to Chicago, Illinois.